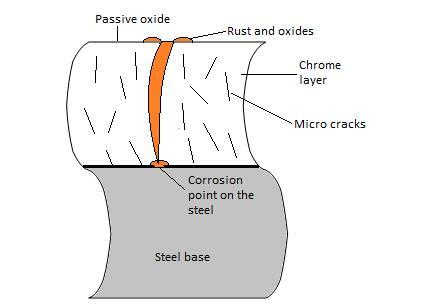 In extreme corrosion environments such as the ones close to a coast line or offshore platforms the passive oxide layer that covers the chrome plating is being attacked and destroyed in a much faster way than in normal conditions, thus allowing the corrosive agents to penetrate the chrome by using the micro cracked structure of the chrome (Pic.1), and attack the steel material that we are aiming to protect. 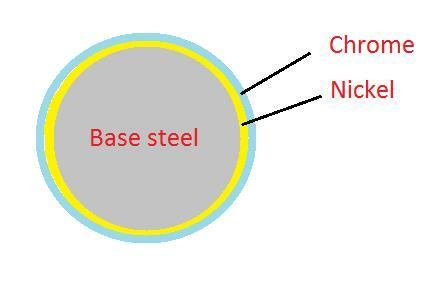 In contact with the steel base, the corrosive agents attack the structure of the steel and through the same micro cracked structure releases corrosion products that deposit themselves on the exterior of the rods as rust or oxidation (Pics.2A & 2B). How is nickel plating done? The obvious questions here would be – what is difference in between the two and which one is best for my process? Bellow we are going to try to explain how each individual approach for nickel plating works. Electroless nickel is an auto catalytic chemical process used to deposit a layer of alloy nickel (85 – 95% nickel) and other materials such as phosphor, boron without the use of electrical power. Basically “electroless” refers to an immersion reaction that does not use a power source to achieve a coating onto another metal surface. This is achieved by a chemical catalyst already present in the solution that creates and causes the nickel to plate autocatalytically. Since the use of electrical power is not needed, this represents a great cost reduction but also a simplification of the actual nickel plating process as there is no use of rectifiers, electrical power, complex filtration methods and no sophisticated machines. Also another major advantage of this system is that the nickel layer deposits itself with the same thickness on all areas of the parts as since no current is involved and the associated problems of current distribution do not exist (Fig.5 a & b). Electroplating nickel is an electrolytic process for depositing a layer of nickel upon a metal – electrodeposition (Fig.5a). 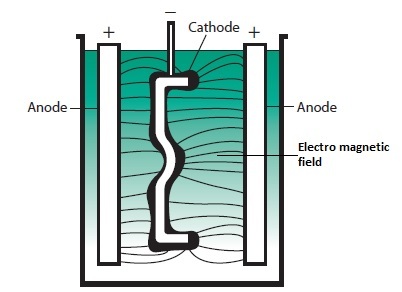 Electrodeposition process essentially involves passing an electrical current between two electrodes immersed in an electrolyte. The metal that we want to be nickel plated is the cathode (negatively charge) while the positively charged electrode represents the anode. The electrolyte contains soluble nickel salts along with other. When dissolved, the nickel salts dissociate into divalent, positively charged nickel ions (Ni++) along with negatively charged ions. When current flows, the positive ions react with two electrons and are converted to metallic nickel on to the cathode surface. A key characteristic of this method is the increase speed with which the nickel deposits itself onto the cathode, unlike electroless nickel plating, and ease in compliance with the RoHS and REACH directives as per the absence of restricted substances such as Lead, Cadmium, substances that are present in the electroless process. 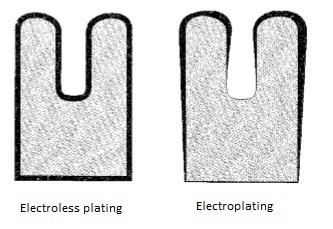 As it can be seen, there are fundamental differences in between the two types of nickel plating technologies / approaches, and while these are important aspects to be considered for the actual nickel / chrome platter (balance between increase speed of deposit the nickel using electroplating, the economy made by not using electrical power or complex machinery, the even distribution offered by electroless plating, or the thicker deposits possible by using electroplating, etc), these have no impact for you, the end user of the product. What is important to the end user of the rods is that nickel plating increase resistance to corrosion, ability generated by the amorphous alloy that is free of any pores and / or cracks. If nickel plating is so resistant to corrosion, why not have only nickel plating a bar? By themselves, both chrome and nickel offer a number of advantages and disadvantages. 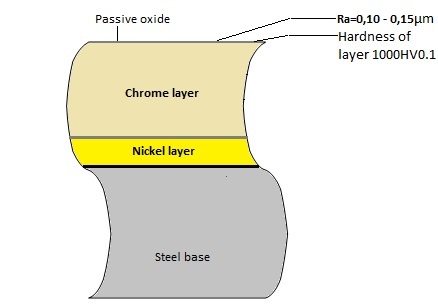 General nickel plating, while resistant to corrosion is subject to tarnish and has a lower hardness value (in between 500 – 700 HV0.1) than that of chrome. 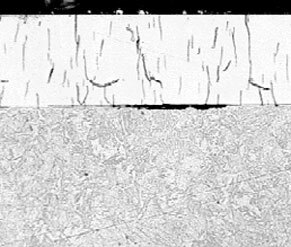 While much harder with hardness values easily reaching 900 – 1000 HV0.1, chrome is not as resistant to corrosion because of its micro cracks, but provides better wear resistance layer with excellent low-friction characteristics for the piston rods as exemplified in Picture 6. *All above mentioned results confirmed during extensive laboratory tests, tests performed and results evaluated as per ISO9227 and ISO10289. If you have any comments, input or observations, feel free to share them here. I’d be happy to know your thoughts. If you wish to be advised on my next posts and to receive additional material and updates soon, please leave your email-address here. 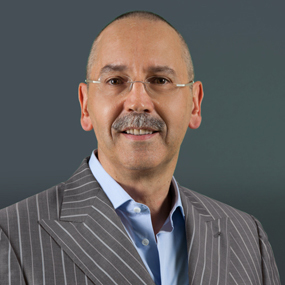 Discover the Secret Data about the Price War in the CYLINDER BUSINESS. Straightness problems on already machined parts?